The community of Mathare 3A, built along a small river valley in Nairobi, is located in one of Kenya’s oldest and largest slums. It is lacking in most basic services such as sanitation and electricity. There are few permanent structures, with most people living in temporary shacks made of wood and corrugated iron. Now a team of Cambridge researchers and students has been working on a project under the UN-Habitat-coordinated Global Network for Sustainable Housing (GNSH) to build a community centre in the heart of this impoverished area, and they are doing so using a model that makes the community’s involvement central to the process – participatory design. This is the first time that UN-Habitat has worked with a university on a project like this, and it is hoped that it will provide a scalable model for future projects with other communities and institutions. The first residents started arriving in the Mathare Valley in the 1920s, and by 2012 the population was estimated at 188,000 – with around 1,500 living in the informal settlement of Mathare 3A. The Kintaco community hall currently consists of a temporary structure with a capacity for less than 100 people. At present, it is mainly used by the men. Ana Gatóo and Elizabeth Wagemann, also from the Department of Architecture, have now produced construction drawings that will enable the residents of Mathare 3A to build a new, more useful community centre for themselves. The structure consists of replicable units so that, with some training, the residents will be able to learn quickly how to build the hall under the guidance of an onsite engineer. One of the crucial steps in the redesign of the hall saw Gatóo travel to Mathare in January 2015. As Gatóo explains, “engaging with each sector of the community was essential to ensuring that the preliminary designs reflected the input of all those who would use the hall in different capacities and at different times of day. “There are instances, for example in the neighbouring settlement of Kibera, where community construction projects aren’t used by the residents. 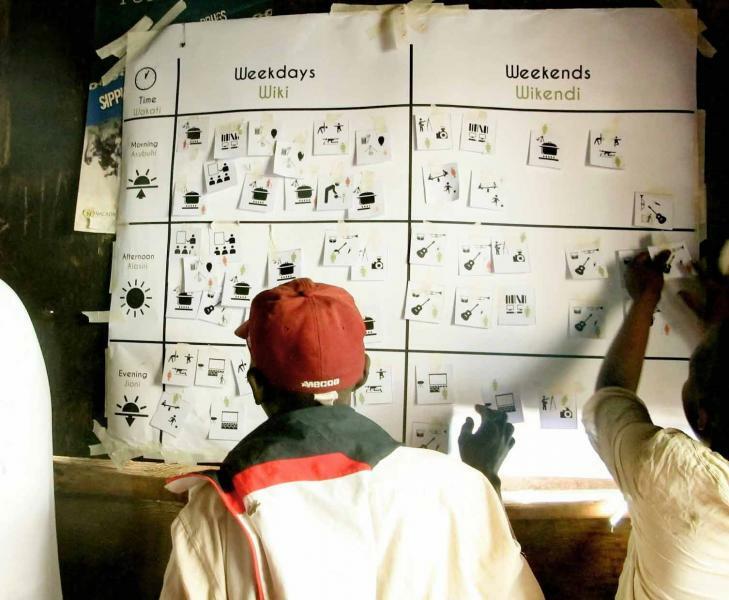 The participatory design process is essential for fusing the community’s ambitions for the space with the material and organisational resources necessary to realise the project. Involving the community from the beginning is important in ensuring that, once it is built, they will manage, maintain, and above all make use of it,” says Bock. Supported by the UN-Habitat programme, the project draws on the expertise of the Department of Architecture’s Natural Materials and Structures group where the Cambridge team is based. Led by Michael Ramage, the group focuses on adapting natural materials and traditional methods to contemporary architecture. The design team formed by Maximilian Bock, Ana Gatóo and Elizabeth Wagemann was also supported by Research Associate Thomas Reynolds, Masters students Bob Muhia, Katherine Prater, Anna Rowell and Thomas Aquilina, and undergraduate Chloe Tayali, who have each been volunteering around six hours a week on the project. In their completed design for a 15x30m building, made out of gabions filled with local or recycled stone and a floor and roof structure made from bamboo, they have managed to match what the community had imagined as well as what the complex network of other stakeholders want. The team has also struck up a unique partnership with the Kenyan Forestry Services to provide the sustainable materials for around $20,000 instead of the team’s original estimates of $100,000. 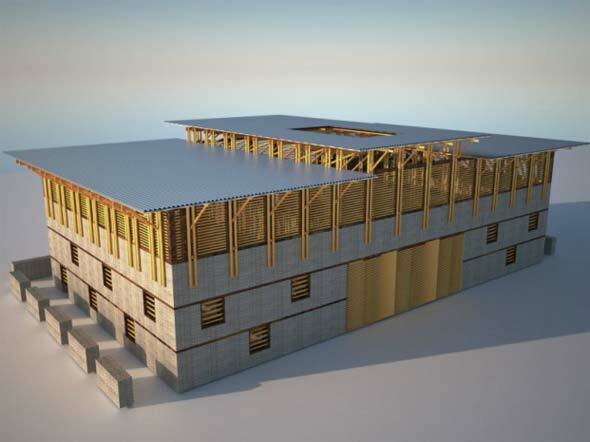 “The design could serve as a model for other community centres using locally sourced sustainable building materials,” says Samson Mogire from the Kenya Forestry Research Institute. As an experimental project, the team feel it has so far been a great success. The residents of Mathare are already very engaged and their feedback sessions have been lively with questions about the hall and the construction process. And now as the project moves from phase to phase, it also moves further into the ownership of the community. 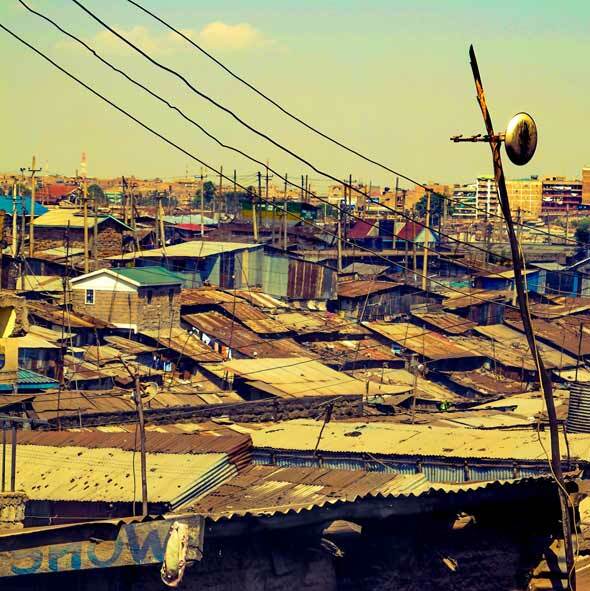 Despite its size, Bock states, Mathare 3A has been identified as an area that has previously been overlooked when it comes to development initiatives. It is hoped that projects such as this one will draw attention and further successful development projects to the settlement. Back in Cambridge, the team has learnt a lot to apply to participatory design projects in the future, and acquired experience designing with materials that will be important for future research. In two years’ time they will carry out an analysis of how the materials are performing and how the hall is being used to see what else can be learned from this process of building from the ground up. The project is also part of the EcoHouse Initiative, which drives sustainable urban development in the developing world. EcoHouse was funded by the AngloAmerican Group Foundation. The research has been enabled by the Higher Education Innovation Fund. Inset images: video courtesy of Roadmap to Mathare; a participatory design session in Mathare 3A (Ana Gatóo); the design for the new community centre (Maximilian Bock, Ana Gatóo, Elizabeth Wagemann, Department of Architecture); Mathare 3A (Ana Gatóo).